Most of us have come to rely heavily on email, in many cases to our own detriment. Now, our inboxes are overflowing—and overwhelming. Email has become such a black hole that the urgency of anything sent in an email is overshadowed by the sheer volume of incoming messages. How many times have you heard (or said), "I'll resend that note, just to put it at the top of your inbox?" Why yes, that makes perfect sense! My inbox is already overflowing, causing me to lose important messages, but by all means, add to the pile. But, it seems we're running out of options when it comes to cutting through the clutter with important communications. When you add text messaging, social media, collaboration platforms and social intranets, it can be hard to decide what types of conversations belong where, and which is the true email alternative. Because each carries its own nuance, style, format and function, it's important that you make the right choice. Otherwise, you risk offending the recipient, or having the message misinterpreted or misunderstood—or worse: lost completely. What's the difference between an intranet and email? What goes on the intranet instead of in email? These questions are understandable, considering many companies seem to use email for EVERYTHING – from sending quick notes and scheduling meetings to document sharing, project planning, and even brainstorming. It's their "go-to" tool, and most wouldn't know how to function without it. As more companies begin to realize the deficiencies of email, many are turning to social intranet software as their email alternative. And it makes sense. Many of the functions we've twisted email into performing are fulfilled much more elegantly and efficiently on platforms like Communifire. But as social intranet adoption grows, so too does confusion over exactly what belongs there. Should we still be using email to send documents? What about sensitive company data? How about communicating with customers or partners—should we grant them access to our company intranet? The answer is simple: it all goes on the intranet. All document and data sharing, company communication, and project collaboration should happen on your intranet. Period. Quite frankly, email was never designed to do any of these things, and over time, we've twisted it into a catch-all tool to fulfill our every business communication need, because nothing else better existed. Today, social intranet software provides the ideal solution to team and project management, collaboration, and communication, keeping the entire company up to speed on important news, and resolving the shortcomings of email overuse. Social intranets can even communicate with outside entities, like customers and partners. So, why is the social intranet the best place for almost every business-related communication? Important emails might sit in employees' inboxes for days before being read. Make your social intranet THE PLACE for everything important, and employees will instinctively go there for the latest news. When information on your company intranet is timely, current, and relevant, employees will quickly come to prefer it as their main source of information. From late-breaking news about a new customer win, company policy updates, and Q&A about open enrollment for health insurance, to new project details, brainstorming input, design feedback, and even discussions over where to hold this month's team-wide lunch outing, Communifire enables everyone to get the latest information, without having to sift through 25 email threads. 2. It tears down information silos. When you're using email, IM, and other media, communication becomes scattered across each of these formats, and it exists in a vacuum. What happens in email, stays in email, because it's not collaborative ... and if the conversation shifts to IM, the email thread is lost, along with any relevant context and historical data. But with an email alternative, like Communifire, all communication is captured, archived and accessible to everyone who needs it from anywhere. Feedback, input, suggestions and more are all readily available, instead of becoming lost at the bottom of a growing pile of unread emails. You don't necessarily have to see the entire history of the discussion thread, but it's there if you need to refer back to it. Let's say your team is collaborating on a new web interface design project for a client. You've tried several different concepts but have run into technical challenges, and it's taken considerable troubleshooting to resolve the problem. If those conversations have happened in email between just two people, only those people have access to the process and ultimate resolution. What happens if another team hits that same roadblock? They have to reinvent that wheel for themselves. But, if that conversation happens on Communifire, they can search the platform and get to the answer in a matter of minutes. A lot of companies worry that information they post on Communifire could fall more easily into the wrong hands and that email is somehow more secure. This couldn't be further from the truth. Just ask Hillary Clinton or anyone at Sony. Let's be honest: if the content you need to communicate is so secretive and sensitive, there's a good chance it's either illegal, or you shouldn't be discussing it at all. While there's not much you can do to stop a rogue employee from copying and sharing data from the company intranet, there's also nothing stopping that same employee from forwarding proprietary data via email either. With an email alternative like Communifire, you can set very tightly controlled access provisions, granting privileges only to those specific individuals who require them. And, you can track exactly who has accessed the platform at any time. With Communifire, you can even securely give customers and clients access to your intranet, where they can tap into your FAQ or knowledge base for technical support and service. Clients can be given access to document sharing in a secure group where they can provide project details, review proofs, and collaborate with your internal team. And thanks to autofill, there's zero chance the wrong person will be accidentally copied on a sensitive email. Even if you cc: half the company on a single email, email is still one-to-one communication. Replies can get lost and out of sync, confusing the umpteen people who were copied, half of whom probably didn't need to be included in the first place. In a social intranet, however, conversations happen naturally, with replies and comments happening in-line and in full view of the required participants. In essence, everyone can see what everyone else has to say, in a much more natural, conversational flow, similar to the way Facebook works for personal communication. This structure can be really helpful when it comes to project collaboration. Let's say your marketing team is working on a new sales sheet design. You've got people from the marketing, sales and product teams involved, along with their supervisors and managers, and any other executives who have final approval authority. With so many cooks in the kitchen, using email quickly turns the feedback loop into a gigantic tangle. The product team can't see that sales has already provided input, and the two are in direct conflict. The designer ‘s blood pressure shoots up 20 points because he's first told one thing, then another, and he's wasting time re-working things over and over. With Communifire, those problems are eliminated. Everyone can see one another's input and feedback, and they can work those differences out before the designer blows a gasket. 5. Social instincts guide our scruples. As previously mentioned, email is no more secure than shouting your company news from the rooftop. But, here's the funny thing about "social" tools—we've all come to assume that everything we post is public. Our social instincts now come from Facebook. Unlike email, there's no veil of privacy, which forces us to think more carefully about what we post, how it's phrased, and how it may be perceived. The reality is we're just somehow smarter about what we post on social media (or at least most of us are). This is distinct advantage of using an email alternative, like social intranet software, as a business communication tool. We've all heard horror stories of awful emails that somehow found their way into the media, the boss's hands, or the competitor's inbox. With a platform like Communifire, those types of problems are minimized. Employees will be less likely to post inflammatory information, gossip, or other scandalous material if they know everyone can see it. 4 Ways to Make Your Social Intranet an Effective Business Communication Tool. Don't create too much clutter and noise, or simply dump everything you own onto the platform. Make sure the information is relevant and valuable for employees—that it's what they need, not one more chunk of data to pile into their already overloaded carts. Take down information or documents that are outdated or inaccurate. Make it easy for people to find what they need, opt-in and out of groups as appropriate, and search. No matter how organized your intranet is, there's no substitute for a great intranet search engine. Everyone organizes in different ways, and it's sometimes hard for one person to figure out how another would group documents and data. With search, it doesn't matter. Anyone can find what they need in seconds. 3. Ask for feedback and respond. Don't be afraid to ask your employees to tell you what they think. The whole point of an intranet is to improve communication, but you can't do that if you don't give staff a way to comment on company posts. It's also imperative that you respond to their questions and concerns with honesty and transparency. Team input that falls on deaf ears will only drive employees away from using your intranet and make them think you either don't care or have something to hide. 4. Add gamification elements, like badges, leaderboards, etc. Intranet gamification will encourage employees to participate and engage on your company intranet, providing intrinsic motivation to participate. A bit of friendly competition goes a long way toward encouraging dialogue. Allow employees to earn badges or points for answering a colleague's question or responding to feedback requests in a timely manner. Consider taking that one step further by offering tangible rewards—like a small bonus, a gift card or other prize—for employees who contribute toward making your intranet an awesome place. 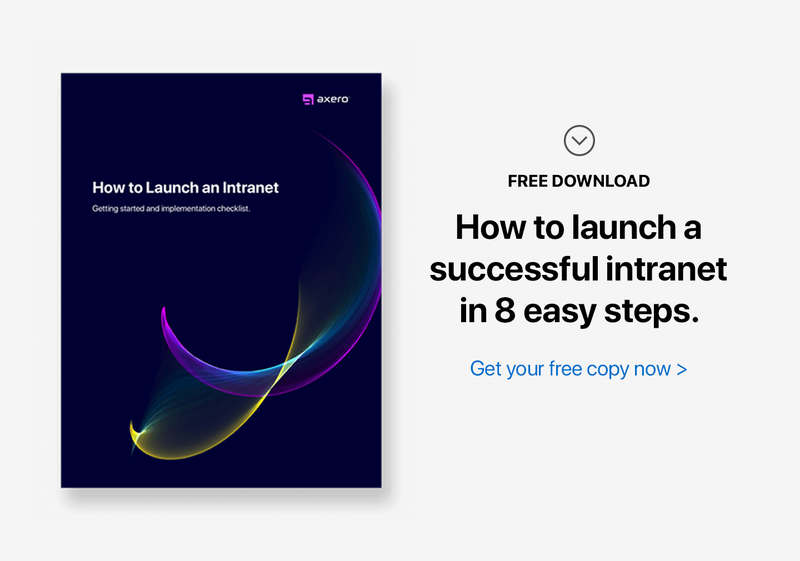 By far, the best social intranet strategy is to just get started already. If you want to improve communications, find an email alternative, and create a more transparent, interactive and open business culture, consider shifting all business communication to a platform like Communifire. Save time, money and energy for you and your employees with social intranet software.